Is eSports really worth all the hype? This article is a part of InvestorPlace’s Best ETFs for 2018 contest. Robert Waldo’s pick for the contest is the ETFMG Video Game Tech ETF (NYSEARCA:GAMR). The start of 2018 has been difficult for some investors, with multiple record-setting dips in the Dow Jones Industrial Average and other market struggles putting a dent in the overall momentum experienced throughout most of 2017. Yet, despite all of these difficulties, the ETFMG Video Game Tech ETF (NYSEARCA:GAMR) still stands tall as one of the best ETFs in our contest, currently placed in the No. 5 spot out of 10 other picks, with a 6% return year-to-date. And, if you ask me, GAMR still has a strong chance of coming out on top over the competition. With that said, let’s put aside the contest lingo for a moment and explore the longer-term potential behind GAMR — a unique exchange-traded fund that focuses primarily on companies that produce video game software. The video game industry is no longer in its infancy, but there are still several growth catalysts to look forward to, and as the industry reaps the benefits of this growth, so will the GAMR ETF. However, eSports is the first, and perhaps most promising, growth catalyst for the industry I want to discuss. Broadly defined, eSports are events where gamers go head-to-head in competitive video games in front of vast online and live audiences. The various video games involved in eSports span many different genres like fighting, shooting and strategy. Sounds exciting, right? But the prospect of eSports is much more enticing when you consider some of the growth factors that back up its base-level description. In the infancy of eSports, games were not necessarily designed to become sports; however, certain games gained this competitive association with the introduction of online, multiplayer capabilities, which inevitably led to massive community followings. For example, Starcraft, a popular real-time strategy game released in 1998, was not designed specifically to be played as a “sport”, but the skill required to master it and compete with other human players simply led to its widespread adoption as one of the premier eSports games, particularly in South Korea. The online component of gaming meant millions of gamers could participate in endless competition with the click of a mouse and they didn’t even have to leave the house. And similar to more familiar sports like football and basketball, anyone can learn how to play a video game, but only few can master it and become a true pro. Likewise, only a few games become popular enough to be considered titles worthy of official eSports competition. So what’s the point of this history lesson and how does it relate to GAMR’s long-term prospects? Since the creation of Starcraft and other early eSports games like Quake 3 Arena (a first-person shooting game), more gaming studios have designed games with the intent of them becoming adopted as official eSports. Newer games designed for eSports competition focus on being perfectly balanced to create an “even playing field” for competitors, while also being visually stimulating and innovative in a way that sets them apart from other games. The continual development of these games alongside their acceptance as an eSport title is where much of the promise lies in several of GAMR’s key holdings like Activision Blizzard, Inc. (NASDAQ:ATVI) and Electronic Arts Inc. (NASDAQ:EA), as the video game studio behind the latest hit is sure to see a massive jump. And there’s plenty of room for multiple hits as eSports encompasses many different styles and genres of video games. In the past, eSports in gaming was less of a driver — more a result of the general rise in competition and popularity thanks to online multiplayer capabilities — but competitive games are now more distinct and the demand for creativity and variety enables continued growth for video game companies in this area alongside several others. But, alongside the general proliferation of eSports viewership and participation, it’s also important to consider the continued strength of games in general as well as the viewership of non-competitive games. After all, not all video games are designed for eSports competition. Consider that in the month of January alone, Amazon.com, Inc.’s (NASDAQ:AMZN) Twitch video game viewing platform had an average viewership of roughly 1 million viewers — that’s more than “[t]he total daily viewership of MSNBC and CNN” as InvestorPlace advisor Matt McCall points out in his analysis of GAMR. And this interest in gaming doesn’t just apply to the U.S: Asia and Europe have more than 912 and 605 million gamers, respectively, which largely exceeds the number of U.S.-based gamers (200 million). Furthermore, Chinese gamers spend more time playing games — 15% of their leisure time — than those in the U.S. 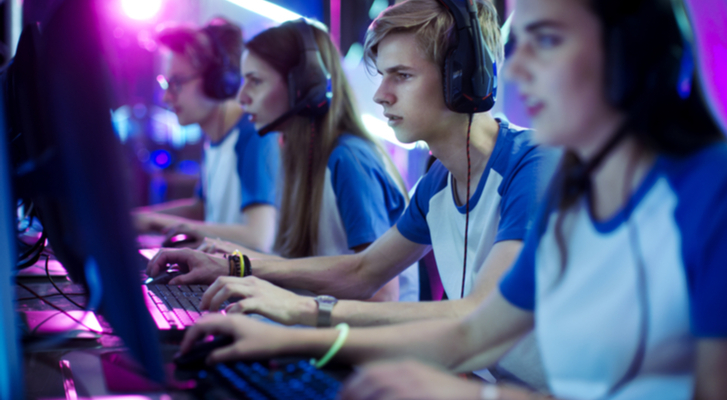 Beyond the eSports catalyst, the baseline strength of the industry synergizes with its newer growth prospects in a way that makes the GAMR ETF one of the more solid ETFs to buy this year. This is especially true when you consider that the fund also includes several hardware companies like Nvidia Corporation (NASDAQ:NVDA) and Intel Corporation (NASDAQ:INTC) to act as a balance. These stocks have non-gaming-related strengths as well as a direct presence in the industry. For example, Microsoft Corporation (NASDAQ:MSFT) has its Xbox console system, but it also announced that it seeks to use its Azure cloud technology to essentially become the Netflix, Inc. (NASDAQ:NFLX) of gaming by offering a monthly streaming service that lets you stream games rather than buy them. This would allow MSFT to tap into the over 2 billion gamers that are currently out there. This is just one of many companies included in GAMR that have significant long-term prospects that are tied to eSports’ rising popularity and other promising factors that are outside of that catalyst. For this reason, the fund is a stand-out among other tech ETFs and it remains one of the strongest funds for those who are interested in making significant gains over the next few years and beyond. Article printed from InvestorPlace Media, https://investorplace.com/2018/03/etfmg-video-game-tech-etf-still-winner/.